Developments in Surface Contamination and Cleaning, Volume Ten, provides a state-of-the-art guide to the current knowledge on the behavior of film-type and particulate surface contaminants and their cleaning methods. This newest volume in the series discusses mechanisms of particle adhesion, particle behavior in liquid systems, and metallic contamination and its impact. In addition, the book includes a discussion of the types of contaminants, with resources to deal with them and information on environmental issues related to surface contamination and cleaning. 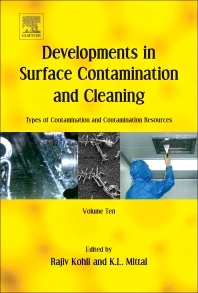 Taken as a whole, the series forms a unique reference for professionals and academics working in the area of surface contamination and cleaning that also includes information on cleaning at the micro and nano scales. 2 Why There Are Standards? Dr. Rajiv Kohli is a leading expert with The Aerospace Corporation in contaminant particle behavior, surface cleaning, and contamination control. At the NASA Johnson Space Center in Houston, Texas, he provides technical support for contamination control related to ground-based and manned spaceflight hardware, as well as for unmanned spacecraft. His technical interests are in particle behavior, precision cleaning, solution and surface chemistry, advanced materials and chemical thermodynamics. Dr. Kohli was involved in developing solvent-based cleaning applications for use in the nuclear industry and he also developed an innovative microabrasive system for a wide variety of precision cleaning and micro-processing applications in the commercial industry. He is the senior editor of this book series “Developments in Surface Contamination and Cleaning”; the first ten volumes in the series were published in 2008, 2010, 2011, 2012, 2013 (Volumes 5 and 6), 2015 (Volumes 7 and 8), and 2017 (Volumes 9 and 10), respectively. The second edition of Volume 1 was published in 2016. Volume 11 and Volume 12 (this volume) are expected to be published in 2019. Previously, Dr. Kohli co-authored the book “Commercial Utilization of Space: An International Comparison of Framework Conditions”, and he has published more than 270 technical papers, articles and reports on precision cleaning, advanced materials, chemical thermodynamics, environmental degradation of materials, and technical and economic assessment of emerging technologies. Dr. Kohli was recognized for his contributions to NASA’s Space Shuttle Return to Flight effort with the Public Service Medal, one of the agency’s highest awards. was associated with IBM from 1972 to 1994. Currently, he is teaching and consulting in the areas of adhesion science and technology and in surface contamination and cleaning. He is the founding editor of the Journal of Adhesion Science and Technology and is editor of 85 books, many of them dealing with surface contamination and cleaning. In 2002, the Kash Mittal Award was inaugurated for his extensive efforts and significant contributions to the field of colloid and interface chemistry. Among his numerous awards, Dr. Mittal was awarded the title honoris causa by the Maria Curie-Sklodowska University in Lubin, Poland in 2003.